According to the recent surveys and tests, BitDefender Windows 8 Security has been chosen as the 2013’s best antivirus tool for Windows 8 operating system. It is tailor-made for Windows 8 OS with some great security features, options and add-ons. It offers complete privacy protection incorporated with ‘BitDefender Safepay’ feature, which opens online shopping and banking pages in an isolated and secure browser. It has been tested by major product reviewing institutions – AV-Test and AV-Comparatives and consequently chosen as the “Product of the Year”, and “Best Antivirus for 2013” product. It has won many accolades from top product review websites and companies like CNET, PC MAG, etc. BitDefender Windows 8 Security has many useful Windows 8-specific features which protects your computer in real-time, blocks phishing attacks, and filters your mail box. A 30-day trial version is available for download with almost the same features as the full version, which can be purchased for $74.95 per year (3 PCs). The latest edition comes with less than 3MB setup file and installs it straightforwardly without any glitches. The setup file runs an introductory scan to check the system configuration, downloads instantly the complete product package and installs it without delay. It requires a reboot after the installation. 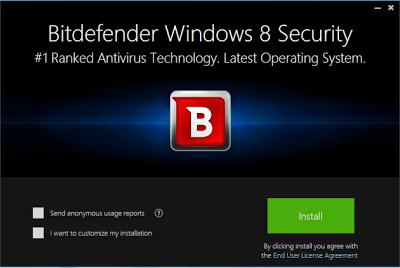 The custom-made interface of BitDefender Windows 8 Security is simple but so attractive compared to other antivirus products like Avast, AVG, and Norton. As usual, the main notifications and options are arranged in a tile-format such as Events, Settings, Autoscan, etc. which can be customized easily. You can set the Autoscan to Quick, System, Custom, Vulnerability, and Rescue modes. 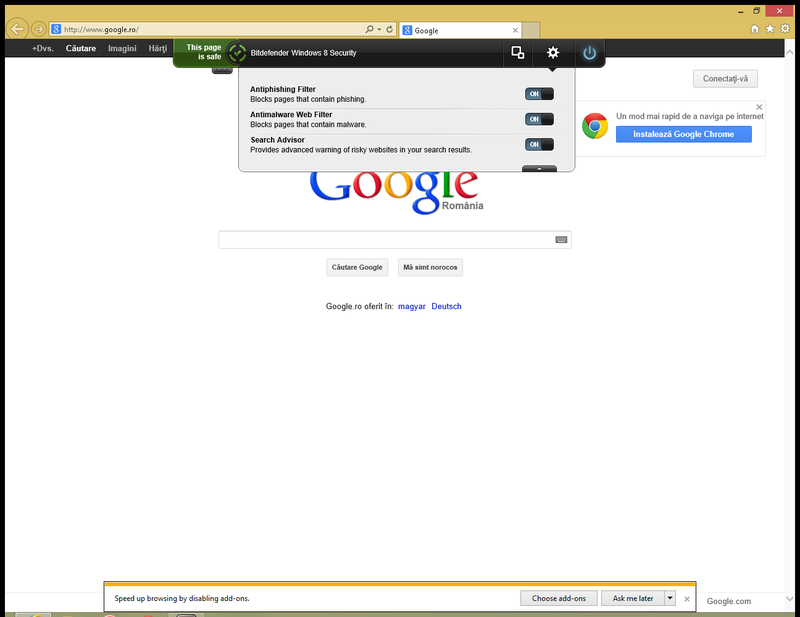 The other significant options like Antispam, Privacy, Firewall are placed below the interface. At the top of the interface, a drop-down button ‘MyBitDefender’ is sited which has preferences to check the Account Settings, Dashboard, and Parental Control. 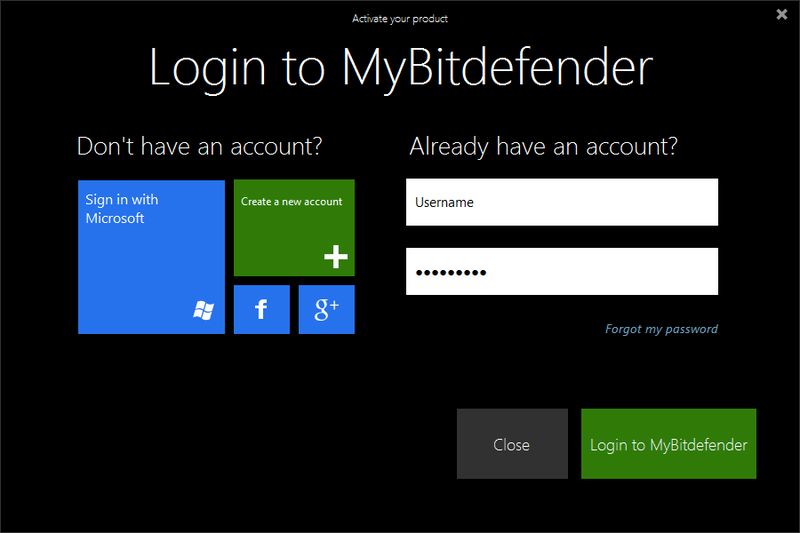 The product activation process is seized in the interface itself, and you can register a new account using Microsoft, Facebook, Google Plus or the default BitDefender one. Early Start-up Scanner – Incorporated with the Windows Security Center and regularly notifies you about the computer’s security status. Scan Boost Technology – Offers you the top scanning speed, robust protection against malware, and excellent product experience. Proactive App Scanner – Explores your Windows 8 apps automatically and informs you about the threats that have blocked or removed. Security Info – Averts any infected items such as malware at Windows 8 startup using ELAM technology which makes your computer run securely. Active Virus Control – Detects any emerging and unknown threats in running system processes. Two-way Firewall – Keeps your internet connection unauthorized and inaccessible by strangers especially when connected to Wi-Fi networks. Anti-spam – Blocks unnecessary emails from reaching your Inbox. USB Immunizer – Vaccinates all slot-in USB removable drives from virus infections. Vulnerability Scanner – Examines your system for outdated and potentially unsafe security programs and settings. Emergency Rescue Mode – After compromising dangerous threats, it reboots your PC in a trusted location, which also restores and cleans up your system in safe mode. BitDefender Safepay – It opens all online banking and shopping web pages in a separate, protected environment (browser) so that no hacker can access your identity information. Modern Parental Controls – Monitors your children’s online activity remotely and prevents adult and inappropriate content from being accessed. 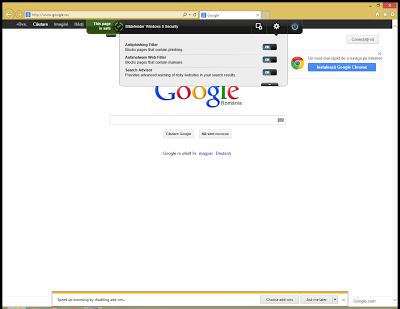 Virtualized Browser – Blocks every web-based threat in an isolated BitDefender-offered browser. 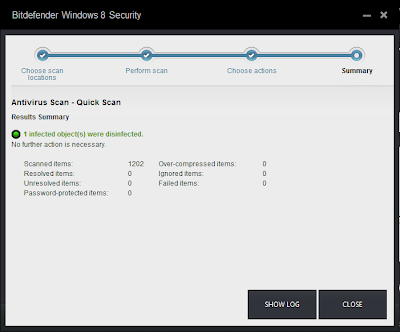 BitDefender provides the scheduled scan via ‘Scan Dispatcher’ that starts scanning your PC when your system’s performance is downgraded or when any system resource falls below a specific threshold. BitDefender Autopilot makes all the optimal security-related decisions of your PC without your intervention and thus provides peaceful experience. Anti-phishing – Blocks phishing attempts from various scam websites that include scripts to steal personal data like credit card details without your interference. Personal Data Filter – Prevents your personal data going away from your computer. Chat Encryption – Keeps your Yahoo! And MSN chat conversations private. 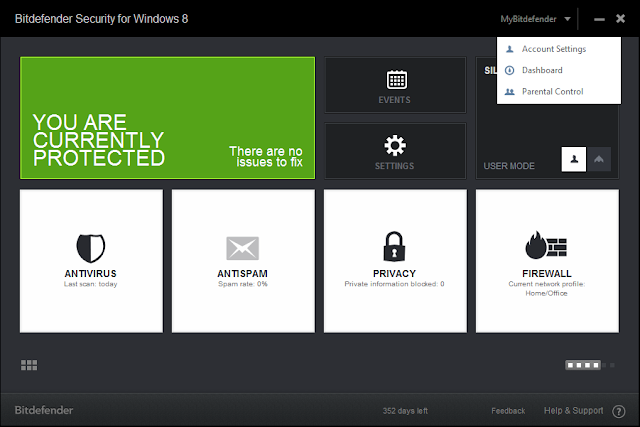 BitDefender Windows 8 Security offers complete control to manage your security from any internet-connected device using ‘MyBitDefender Dashboard’ and ‘Online Remote Management’ options. You can view the active product license status, special offers, and information about the latest products. You can remotely see security status and fix issues of your computer with any of your BitDefender-protected devices. BitDefender Windows 8 Security filters the links exchanged between your Facebook and Twitter friends and you and blocks them right-away. The ‘Search Advisor’ warns websites that are unsafe and risky in Google, Bing, and many search engine results. 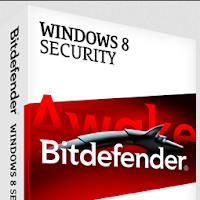 With no interruptions and configurations, BitDefender Windows 8 Security tool offers excellent protection for your PC. You have to first register and then download BitDefender Windows 8 Security from its official website. You can Download BitDefender Insight from Windows 8 app store for free which regularly posts you about the BitDefender products and offers.